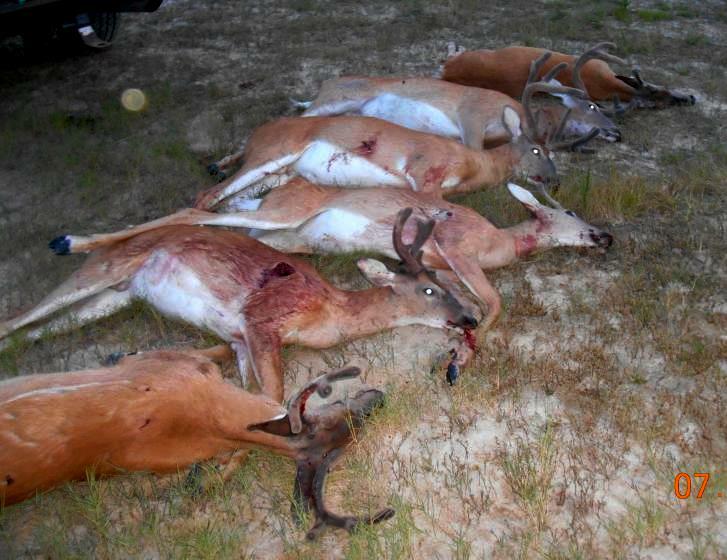 A Cambridge man faces fines in excess of $10,000 on charges he illegally killed six white-tailed bucks in a single evening. Acting on complaints of gunfire in the area July 16, Maryland Natural Resources Police officers found Bryan Edward Nabb Sr., 53, in a field with a rifle and other hunting equipment. He explained that he was shooting under the terms of a deer management permit issued for a property on Blue Water Drive in Cambridge. That permit stated: “Only antlerless deer (does and button bucks) may be taken, unless otherwise stated on permit.” The permit, signed by Nabb, included no additional provisions. After an investigation, Nabb was charged July 23 with six counts of hunting out of season, failing to wear fluorescent while shooting on a management permit and violating a deer management permit. All six bucks, which were in velvet, and Nabb’s rifle were seized as evidence. Nabb is scheduled to appear in Dorchester County District Court Nov. 21. He will be tried under the Maryland Poaching Restitution Act, which requires judges to order restitution and community service in cases of deer poaching. A buck with antlers scoring 150 or fewer points on the Boone and Crockett Club system requires restitution of $2,000 to $5,000 and 80 hours of community service. A fight on a pontoon boat in the Potomac River in Washington County resulted in assault charges being filed this week against a man and a woman from Martinsburg, West Virginia. Robert Craig Coleman, 44, was arrested on charges of first- and second-degree assault and reckless endangerment. He turned himself in at the Washington County Detention Center. Jennifer Friscia, 41, was charged with second-degree assault. Officers responded to a 911 call July 14 at about 6:30 p.m. near the Dam 4 boat ramp. Coleman refused medical treatment for scratches and bites. Friscia was taken to Berkeley County Medical Center for treatment of a broken orbital bone, nasal fractures and a fractured hyoid bone. Witnesses said an argument between the two turned into a physical confrontation as Coleman steered the boat from about 6 miles upstream to the boat ramp. A court hearing date has not been set. A Montgomery County man was charged July 23 with taking 31 undersized striped bass by officers on surveillance in the area of the Kent Narrows drawbridge. Grodbin Eliberto Manzanarez, 43, of Silver Spring, was seen at his vehicle by an officer checking fishing licenses. A consent search of his vehicle turned up a trash bag behind the driver’s seat that contained 31 fish. Manzanarez is scheduled to appear in Queen Anne’s County District Court Sept. 20 for possession of 31 striped bass under 19-inches long and possession of 29 striped bass over the legal limit. If found guilty, he could be fined as much as $2,000. A Hagerstown woman is scheduled to go on trial for fourth-degree burglary Sept. 20 in Washington County District Court for an incident in Greenbrier State Park. Dawn Renee Schlotterbeck, 44, is accused of breaking into a trailer near her campsite and rummaging through cabinets and bags. On July 18, officers were called to the park to investigate a burglary where they found a burgundy woman’s tank top, a pair of black Birkenstock sandals and a blue hair tie inside the trailer that did not belong to the victim. While canvassing the campground, officers questioned Schlotterbeck, who told them she was missing a burgundy tank top and black sandals. When officers showed her the recovered clothing, she remarked, “You even have my blue hair tie.” Schlotterbeck denied entering the trailer, but acknowledged she had consumed a bottle of 80-proof vanilla extract earlier in the day. She was arrested and taken to the Washington County Court Commissioner for charging. A Pennsylvania man was charged July 21 with impaired and negligent operation of a boat by officers on patrol at Deep Creek Lake. John Martin Steele, 57, of Washington, was charged after the vessel he was operating was stopped for having a person riding on the stern. Steele was administered an Intoximeter test by Maryland State Police, where he registered a blood alcohol content of 0.09, above the legal limit of 0.08. Steele is scheduled to appear in Garrett County District Court Sept. 26. If found guilty on all charges, he could be fined as much as $2,300.